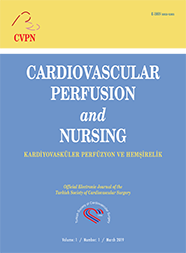 I am pleased to announce that Turkish Society of Cardiovascular Surgery will publish a new official journal with the title of “Cardiovascular Perfusion and Nursing”. This journal will be an open access and fully electronic journal, and published in English/Turkish . The selection of language was based on the power of English in sharing and accessing the scientific material in general and its advantage in application for international indicies in particular and Turkish to increase participation of various disciplines. The reasons to publish this e-journal are numerous. There have been increasing number of articles, almost 500 in 2012, which were submitted to our main journal (Turkish Journal of Thoracic and Cardiovascular Surgery). We are able to accept around 40% of them at maximum. Some interesting articles, mostly based on perfusion and nursing can not be chosen for publication. The new journal will host many of these articles, considering the paucity of journals in this field. The submission process will be the same for all journals to enable easy resubmission. New regulations on perfusionist and nursing schools had a great impact on the scientific progress of our co-workers in the OR and wards. There are numerous bachelor, master and PhD students focused on this filed. Growing potential from our fellow perfusionists and nurses will also have an opportunity to publish their scientific work in a related extensive journal. You can submit your article directly to CVPN through its website (www.e-cvpn.org), keeping in mind that it is not indexed yet. However, full text of your article will be able to be reached through internet by others since it is an open access journal. The application to indexing institutions, such as TÜBİTAK Ulakbim, is in progress.